Dabou is a port town in southern Ivory Coast. It is the seat of both the Lagunes District and the Grands-Ponts Region. It is also the seat of and a sub-prefecture of the Dabou Department. Dabou is also a commune. The town is served by Dabou Airport. Writer Regina Yaou was born in the town. 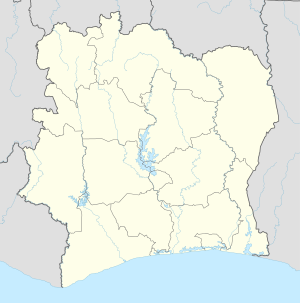 ^ "Ivory Coast Cities Longitude & Latitude". sphereinfo.com. Retrieved 19 November 2010. This page was last edited on 8 March 2017, at 07:29 (UTC).